It is not too difficult to get long shadows at this time of year since the sun is lower in the sky here. I had a nice sharp selfie but I spotted this tree at the top of our road and decided to take it instead. 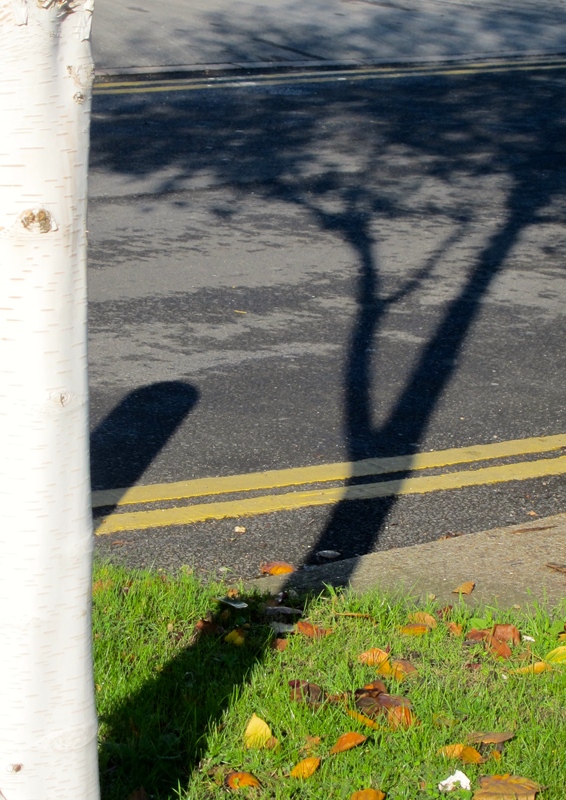 The bark is a beautiful white and there was a bit of autumn leaves on the grass verge before the shadow. It is not so sharp as the shadow of myself and I could not get all the detail of the shadow-tree in the frame but I hope it is a bit more interesting. It was great to see the sun today. It has been very wet this week and we had our first sharp frost last night. We have been very lucky to have got this far into the year before winter finally hits. I guess the next couple of days will be devoted to getting the tender plants under cover. Categories: Long Shadows | Tags: abstract, Long Shadows, Week 14 | Permalink.